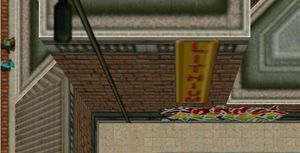 Lithium FM is the Loonies' favorite station in Grand Theft Auto 2 that can only be heard in the Downtown District. It is presented by the schizophrenic DJ, Spaz Funbags, who plays a random array of music, consisting of techno, dance music, Christian pop and oldies. Commercial for "Crazy CJ's". a fast food restaurant. Commercial for "S-Uzi", a brand of machine gun. News; regards rapper Robert DeNegro. Comercial for "Super Leaded Gasoline". This page was last modified on 4 June 2013, at 17:09.